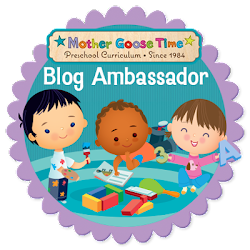 Each month the Blog Ambassador team for Mother Goose Time has a focus topic. Something to think about, get creative about and then write about of course! That's what we do. This months topic has been a bit of a challenge for me. I have seen some awesome ideas roll in from the other bloggers and have been a bit stumped myself. Svetlana at Buzz On In came up with a couple great ones. She added magnet strips to the awesome color cubes we got last month. She also used a tension rod and binder rings to make busy bags that she hung behind her door. Ever since I started using Mother Goose Time I have kept all the folder games, well, in a folder. I have also tucked in there the games from our High Five magazines. I always grab this folder and take it with us when we head to the cottage. We have a little cottage at the coast we are blessed to be able to go to frequently. There is no TV, which is great, but I always want to make sure to have plenty to do. But this is something I have been doing a long time now, so I wanted to come up with something fresh. The left over MGT tools are just too good to recycle. I have a hard time doing that. Just recently we had a new neighbor move in with a 5 year old girl. I dug through some of my left overs and made a little goodie bag for her. Pinterest is full of busy bag ideas. This if of course a great use of leftover MGT stuff. If I had an actual daycare, I think I would put together these busy bags and give them out to the families now and then. Maybe on a Friday or on the eve of a holiday. A time when the families could really use them. I just recently bought a ten drawer organizer off of Amazon. I have wanted one forever and they were on sale with free shipping. I couldn't pass it up. I was hoping it would make some of our old MGT stuff more accessible to use again and again. It certainly has helped. Here are some very simple things I have done. 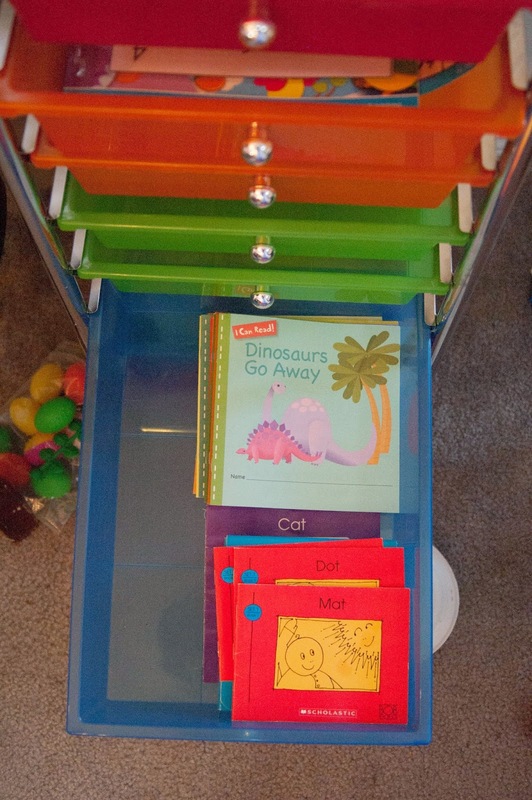 I have a reading drawer for Lachlan. This drawer includes some early readers like Bob Books, Hooked on Phonics early reader and the I Can Read Books from the year and a half or so we have used Mother Goose Time. 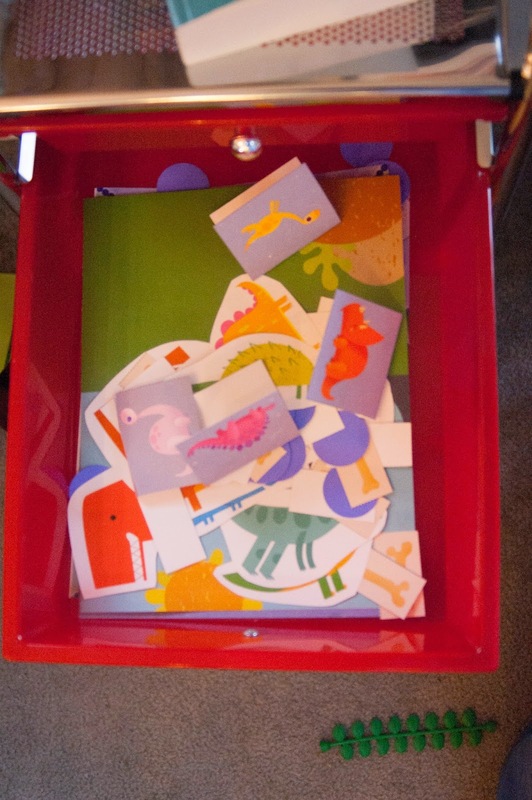 This is the drawer I pull from to work on reading with Lachlan each day. There is a huge stack there of the MGT readers. 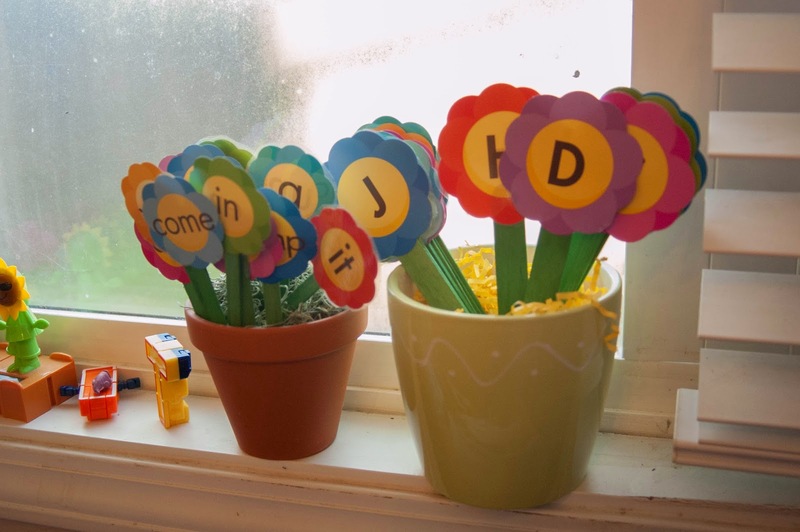 I have the site word flowers in a flower pot on the windowsill right by the drawers. So we can grab the site words that go along with the book to help us with our reading. There is a copy of the site words on the back cover of each book, so we can easily figure out which ones to grab to go with the book we are reading. I grab the letter flowers everyday as we sit at the table and we flip through them real quick like flash cards. This was a new idea I got from one of the bloggers. I can't remember where I read it now. So you will just have to read them all! I filled one drawer with a couple of the folder games and the storytelling set from this month so we can easily grab it while at the table if we are looking for something to do. So far I don't have it that well organized. I need to put the little game pieces and what not in bags. But it's a start. Originally I did not have a drawer designated for Adam but then he designated one for himself. For some reason, this purple drawer, one up from the bottom was calling his name. He constantly was opening it and taking everything out. The things in there were not baby friendly. So rather than fight him on it, I thought I would make it all his. I grabbed all the large manipulatives from the past few months and threw them in the drawer, plus one little rubber vine from our Lego Duplo set. Needless to say he was thrilled and quickly got it open and started taking everything out. 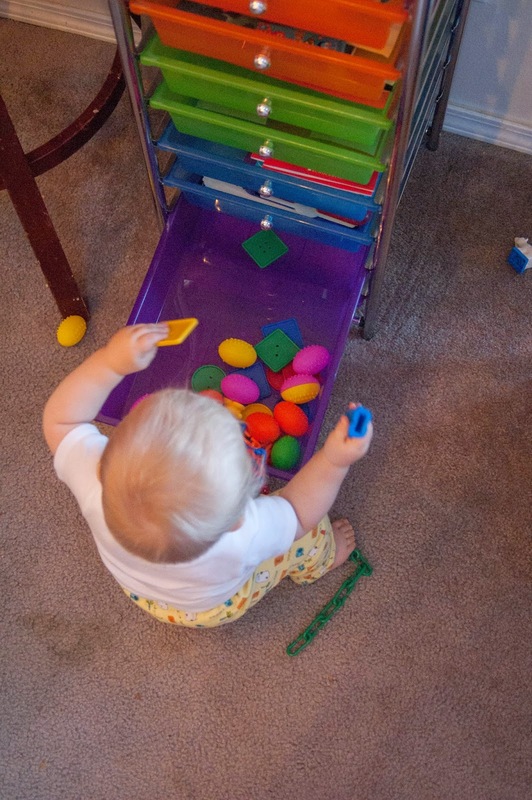 This certainly made these old MGT manipulatives new again for this little guy! A couple of days ago when we got our new pattern set I did some tweaking to it to add another level of learning for Lachlan. Lachlan has always been good at patterns but I didn't think about teaching him what the pattern is called. Like and AB pattern or ABC. But a few months ago we were doing patterns with our neighbor and she said, oh yeah, that's an ABB pattern. I thought hmm, that would be a neat thing for him to be able to recognize, not just the pattern but the type of pattern. So I flipped over the pattern pieces and wrote A, B, C, D on the backs of them. I put A on all the eggs, B on all the small Mussaurus', C on the big Mussaurus and a D on all the fossil pictures. It turned the set into a double sided pattern set. In the pictures below I had Lachlan set up an ABC pattern. First with the letters up. Then I had him flip them over. 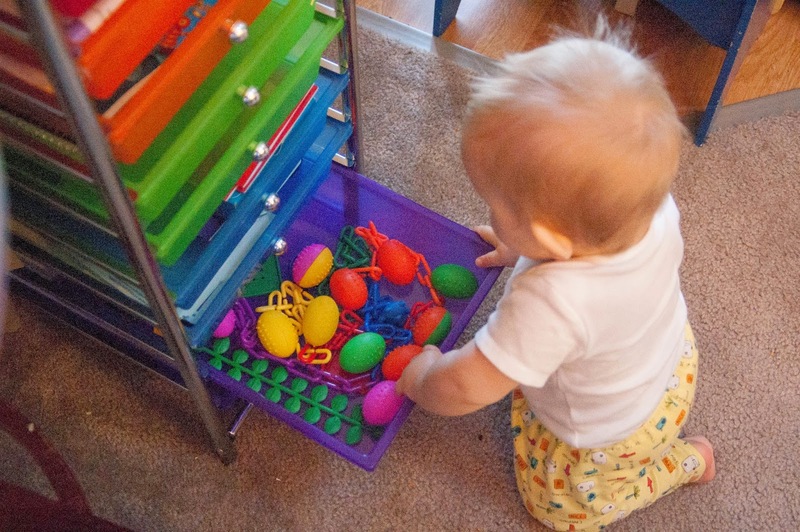 As he flipped them over and saw the same pattern imerge with the pictures I could see a little grin form on his face. It certainly was beginning to make more sense to him. 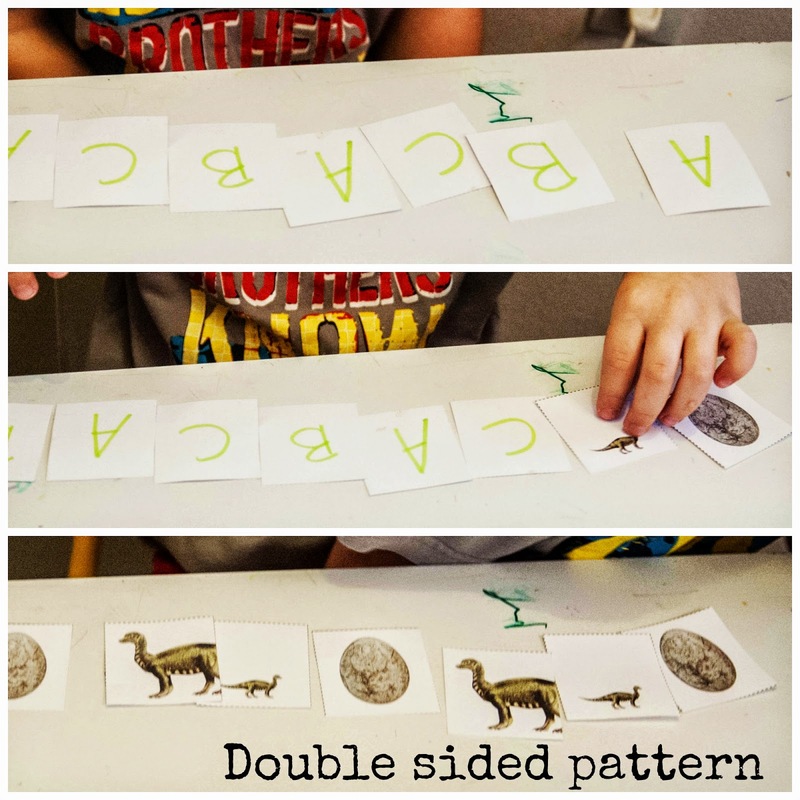 It was a great way to connect what he already knew about patterns with this new concept of pattern types. 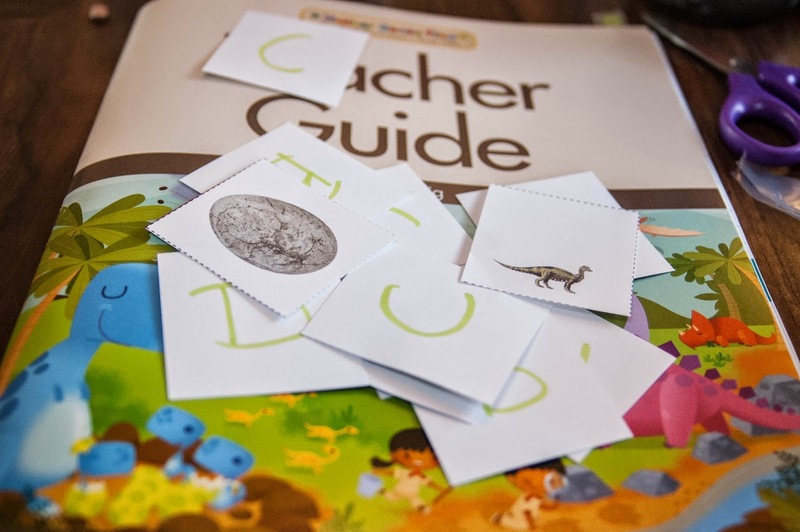 I love the idea of writing the ABC pattern (or what have you) on the back of the Mother Goose Time pattern cards.